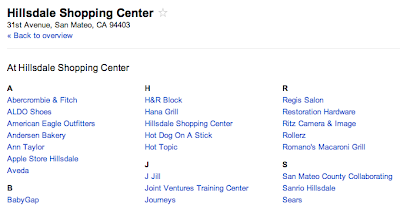 Google Lat Long: Looking for stores in a shopping mall or doctors in a hospital? Looking for stores in a shopping mall or doctors in a hospital? When appropriate, the name of the overarching location will be added to the listings that appear in Google Maps, just beneath a place’s address. 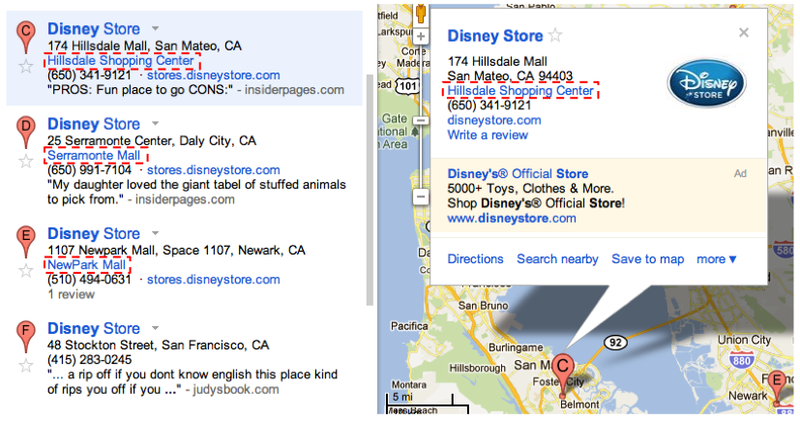 For example, you can now easily tell that the Disney Store near you isn’t a standalone store, but rather, located at the Hillsdale Shopping Center. Similarly, you can more easily see that a specific doctor’s office is at the Palo Alto Medical Foundation, or that the restaurant you’re looking for is actually in the same structure as a local hotel. 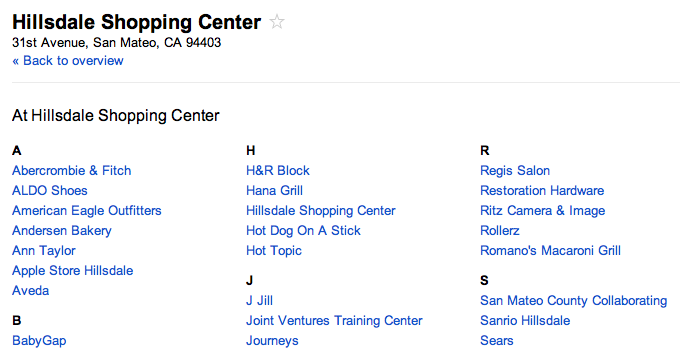 If you click on the name of the overarching location - in this case, Hillsdale Shopping Center - you’ll see a detailed list of all the businesses or professionals at that particular location. Up to 20 listings are provided, and clicking the “More at...” link will give you the complete list. This feature is available starting today for a variety of U.S. locations and venue types, and we hope to expand it to more categories and countries over time. As the holiday shopping season kicks into high gear, being a well-informed and efficient shopper is more important than ever. That’s why we’re excited to introduce a new feature in Google Maps that can help you find places that are located within or are part of larger buildings, such as malls, office buildings, and hospitals.